It’s time to play catch-up. If I can. The thing about being a Type A person is that once I get behind on my blog writing it feels difficult to jump back in without feeling a bit overwhelmed by all I wish I had been posting. That’s when I need to summon the editor in me, the ruthless editor who knows when to jettison and take no prisoners. If I don’t start writing something, this neglected blog will fall entirely by the wayside. 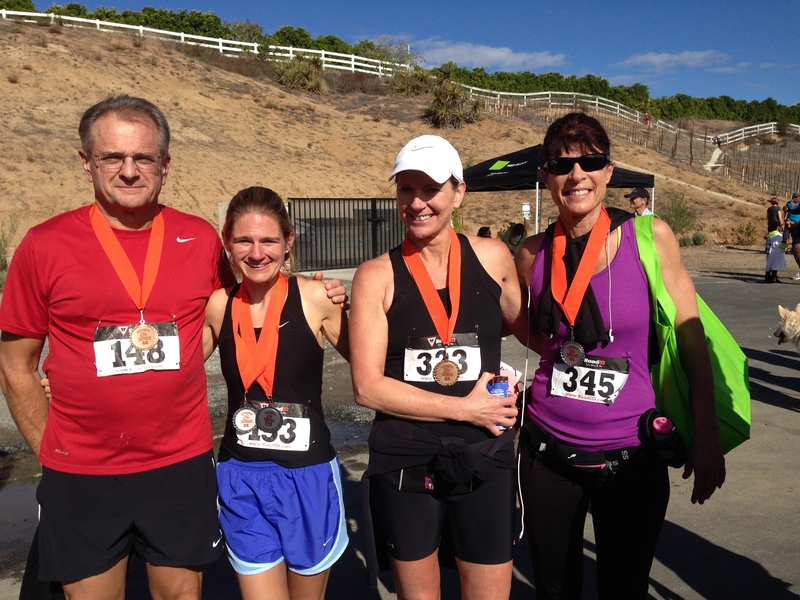 My dad, his trainer and friend Val, and I ran the 5K Turkey Trot on November 30, 2013 at Cougar Winery in Temecula. We signed up months ago, before I performed in the Long Beach Half, and so all that time I had been envisioning this as a “fun run” that I would not particularly get all hyped up about. Like a relaxing 3 mile jaunt for the experience of it. You know, chill. I had the 13.1 to worry about, right? Well, about a week or so out from the run (which is when I started to remember that I had this coming up), I realized that as a runner I both could, and should, race it to the best of my ability. I was not fully tapered, and I think sometimes my husband wonders what the H is going on in my mind when I head out lately. After racing Long Beach, I had foresworn another half this year and wanted to focus on middle distances (10Ks), but then I found that I actually really like the 13.1 distance and that it is hard for me to go out without throwing 8s and 10s and 11s into my training mix. I like to push. I’m a distance runner at heart. My best 8 miler lately has been 1:01:40, at a 7:40 pace. I still need to keep pushing myself to get better and better, but there has been improvement since the end of summer. RESULTS: I placed 9th OVERALL (men/women/all ages); 2nd in all women; 2nd in my age bracket (my age bracket took the 1 and 2 spots in the ladies’ 5K). My time was 22:07.5, but my GPS says I ran 3.3 in that time…so my average pace was 6:42, a PR, and my 3 mile time was more like 19:48 according to Bill. This was not a chip-timed race. But whatever…I’ll take it! The women ages 30-39 took this race for the ladies. The woman who beat me, Jennifer Burris, had a great and award-winning career as a runner in both high school and college. She passed me early on, and I struggled to come even close to her and never did. She was amazing, and I respect that kind of effort so very much. She was one of the only people who passed me (since I was 9th overall for both men and women), and I remember her coming out of nowhere in the first half mile and ZOOM! But what made me tear up was how, when she accepted her award, she had a young child on her hip. I thought, “We are both mamas of very young children. We are both in our 30s. And here we are representing that the female body can be lean and fierce and fearless and competitive against high school girls and even the boys/men.” We took the first and second place spots for all women, and then of course for our age, as well. I felt both moved and extremely powerful. My body has birthed two children and now it can run like a beast, too. (Which still makes me laugh, because not even I would have predicted this new life phase for myself, especially not two years ago when I was still caressing my beloved excuses like a coveted pet). What can we do if we put our whole minds into the goal? Ladies, we are unstoppable. We just have to make our bodies and minds fight for it… Fight for it. Fight! Every single day we have choices about doing our best and challenging ourselves to become better than we were. I wish I could post the pictures of me actually running and finishing, but I don’t want to be in copyright violation since I screenshot them. This is a picture of me after receiving my placement medal (2nd place ladies, all ages). I also received a gift certificate for the running store. Bill says if I consider that it took 22:07 to earn, it is not a bad hourly wage at all! Ha ha. Everyone in our car earned medals, plus one of our friends. My dad was third in his age group (males), and Val was third in her age group (females). I also earned a 2nd place medal for my age group. I like that the awards were placement medals. It feels good to have my Long Beach half-marathon medal as a souvenir, but I prefer when medals have a competitive value attached. Competition (other than biological competition) does not have a place in day to day life, and I am not competitive on a routine basis with other people for any reason; there are, however, times and places to channel the competitive spirit, and racing in my sport is one of them. Competitiveness needs to have a proper outlet, and for me it does. Most of the time when I train, and even when I race, I channel most of the competition toward myself only. I am looking for PRs when I can get them, even while training, but it is also eye-opening to see how I stack up in a field of runners. That adrenaline is amazing. This race was a PR for me. This was a 5K, but I also wanted to look at my 3-mile time. On October 5th, I ran 3 miles in 20:39 on a flat track, and this Turkey Trot would have me clocking in at 19:38 for 3 miles. I improved about a minute. The Turkey Trot was also on a hilly washboard dirt course. New challenges keep my mind invigorated, that’s for sure! Today I went out for 7.7 and had a struggle of a time with it. I finished in 1:00:07, which wasn’t horrible at all (and close to my 8 mile PR on a different route—which is the problem with road racing: the inconsistent variables), but it was one of those runs where my legs felt tight and my mind had to do ALL the work to get through it decently. Sometimes I go out, settle in, my legs go on automatic, and my mind can wander and compose and work things out and create for my children; today, I had to keep all my focus on making my legs MOVE IT! Those are hard runs, because of the mental effort involved. It has also been icy cold here. Leaving the house this morning was excruciating. As my husband said as he coached and patted my shoulder this morning, “Getting started is the hardest part.” He was right; he always is. I’ve had an injury since before the Turkey Trot that subsides and then will bother me. It was bothering me for the trot, but I said to myself at the starting line, “Whatever. Shut it out. You are stronger than the discomfort. Time to race this!” I know I should rest it more, but the injury does seem to be improving. It developed when I started running trails a couple of weeks ago and did a 12-miler. Something went off-kilter, I guess…oh, well! There’s no time or reason for me to wallow. My next race is a fun run with my friend Steve…the Spartan 5K with obstacles in Jan. We’re in the process of trying to change our start time and running into snafus, but we hope this race goes down the way we planned. Other than that, I am toying with the idea of doing another half-marathon in my area in February. I was going to hold myself to racing one a year…but this is almost too tempting. I also have several registration fees listed on my Amazon wish list for Christmas. Hoping I get some of those!